The “Secret Weapon” behind many great recording and mixes! Here is something that not too many people talk about any more, and thus many beginners might not know about. But, it’s one of those tools that I can’t live without! 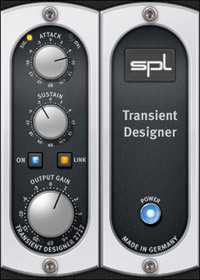 The SPL Transient Designer is a cool piece of hardware, that has also been ported over to multiple plugin versions, that does something that most other dynamic processors can’t do. We never had these at the big studio I used to work at, and now I wonder how we got along without them! These days I have the Universal Audio UAD plugin version, as well as SPL’s own native plugin version. Waves and other companies also make their own similar plugins that are not officially licensed by SPL, and that operate and behave slightly differently, but are doing the same type of thing. The Transient Designer (TD) allows you to adjust the attack and sustain portions of an audio signal, regardless of the dynamic level. So, unlike compressors, expanders, and gates, which act on the level of the signal passing through them, the TD’s settings affect the attack and sustain portions of the signal at any volume/dynamic level. It’s NOT a compressor, expander, or gate, but allows you to make signals punchier, or remove/reduce sustain or room sound, or add more sustain or room sound to your tracks. Sure, you say, but what would you use it for? Another technique I use quite often is to add more attack to drums during dense sections of mixes. In general, with digital recording, enough of the transients are preserved that I rarely need to add more attack with the TD. But, sometimes you’ll get tracks someone else recorded with old drum heads, or a player that plays too soft, and you may need to add some attack for that. I’m fortunate enough that I get to work with really great drummers and great sounding kits, so it’s not that often that I need to add more attack. However, there are cases where a mix is really dense in some sections, with a huge wall of guitars, and you want the drums to cut through a bit more, but without necessarily making them a whole lot louder. My technique is to set up an effects track that I like to call “drum punch”. On that FX track I’ll put the TD, and sometimes even add a small amount of distortion, and then use effects sends to route only the kick, snare, and toms to the “drum punch” effects buss. Then, I’ll ride that track with automation and only bring it in subtly during the dense section of the mix to add a bit more attack to the drums so they cut through more. I usually will roll off all the low end of that punch track so I don’t get any weird phase issues with the low end from the “normal” drum tracks, and because I’m only looking for a bit more “bite” out of this track, not a full range sound. The other rare occasion that I might add a bit more attack to drums is when I may have heavily compressed the drums to achieve a certain effect for a song, but that compression killed some of the attack transients of the drums. The TD can help add some of that back. Another great use of the TD is to smooth out things like guitar sounds where they used a pick and it had too much of that pick attack sound. Works wonders for acoustic, electric, and even bass guitars if you want to DE-emphasize the attack. You can also use the sustain knob to dial in more sustain to your guitar tone as well. Nothing else works quite the same, and it’s a very useful tool when needed. Or, maybe you recorded vocals at home in your bedroom or bathroom or some room without proper acoustic treatment, and you are getting too much of that “boxy” room tone in your vocal tracks. You can dial out a good amount of that using the sustain knob… works much better than a gate or expander for that purpose. I don’t use the TD on every mix, but it’s a tool I won’t live without and it does get used more often than not in at least some capacity on my mixes. It’s also one of those processes where the plugin version works great, and you can have as many instances as your computer can handle, so I don’t see any need to buy the hardware version. If you have never tried it, head over to the SPL site and get a trial version. Or, if you have a UAD Powered Plugins card, and haven’t already bought it, you can activate a 14 day demo of it on your UAD-1 or UAD-2 card. Both versions are the same, and are definitely worth the price and more! ‹ Should you mix your own music?